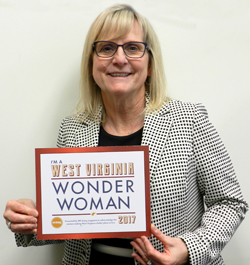 POINT PLEASANT, W.Va. — Fruth Pharmacy president Lynne Fruth has been named a West Virginia Wonder Woman by WV Living magazine. WV Living chose a number of women for this year’s honor. The magazine wanted to recognize women who were making their communities, state and world a better place to live. Fruth joined the ranks of Wonder Women in many different professional areas. There were women from the state supreme court and news media outlets as well as public servants, businesswomen, nonprofit leaders and artists from around West Virginia. Fruth was chosen due to her accomplishments at Fruth Pharmacy. In the past eight years, she took her father’s company as it began to fail and turned it around, expanding the chain to 30 locations. She also played a huge part in tackling the state’s drug epidemic by making Fruth pharmacies the first in the state to sell naloxone, an antidote for opioid overdoses. She also started replacing known medications that can be used to make methamphetamine with medications that have meth-making deterrent ingredients. In other news at Fruth, Larry Anderson was promoted to director of merchandising/purchasing. Anderson, who joined the company in 2009, has over 20 years of experience in the retail industry. He formerly was a store manager, district manager and regional trainer. He has worked with groceries, general merchandise and soft lines.